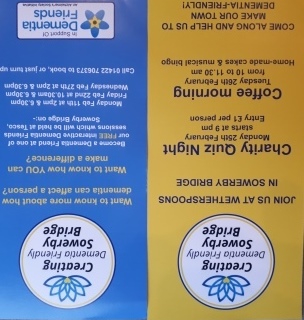 Dementia Friends will be holding a Charity Quiz Night at Wetherspoons in Sowerby Bridge on Monday 25 February, 9:00pm. Entry is just £1 per person. They will also be holding a coffee morning the day after, Tuesday 26 February, 10:00am-11:30am with home-made cakes and musical bingo. If you would like more information about becoming a Dementia Friend, there will be FREE interactive demonstrations at Tesco on Friday 22 February, 10:30am and 6:30pm and also on Wednesday 27 February, 2:00pm and 6:30pm. This entry was posted in Events, Feb, Get Involved / Have Your Say, Health, Sowerby Bridge, Staying Well and tagged Dementia Friendly Sowerby Bridge, Dementia Friends.